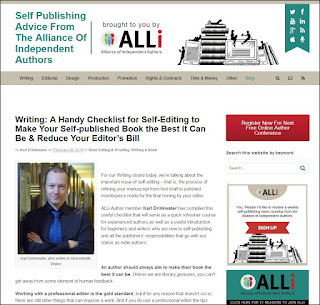 Over on the ALLi website you'll find an article where I give various self-editing tips. Here's a backup of the article. An author should always aim to make their book the best it can be. Unless we are literary geniuses, you can’t get away from some element of human feedback. Working with a professional editor is the gold standard, but if for any reason that doesn’t occur there are still other things that can improve a work. And if you do use a professional editor the tips below still apply, since it is best to do edits and rewrites before sending the work to an editor. The better the work is, the less time they have to spend correcting basic errors, and the editing costs on a more polished manuscript may well be cheaper too. If your book was important enough to write, then it’s important enough to nurture. This is basic, but still needs stating. It’s also important to vary how you do this. Sometimes you need to get away from the screen, so print a draft out on scrap paper (I often do two pages per sheet) and sit in the open air with it. Mark it up with green and red pens (ideas and corrections). Here are some writing and editing tools for authors that can flag up potential errors – though you’ll then need to apply human consideration to understand the issues raised and weed out false positives. Make use of critique groups. You may be lucky enough to have a local face-to-face one (or you could set one up – I’ve been involved with both types in the past), but there are also many online groups that may be useful. Many authors have a small and trusted group of committed superfans who act as beta readers – reading the work when it has gone through numerous edits and is just about finished. They can give lots of useful feedback. Many authors provide a questionnaire to guide the beta readers. This ties in to developing a good-quality list of newsletter subscribers. Go on writing courses. Look out for the ones that give you one-to-one time with a tutor so you can discuss your work-in-progress. I have been on a lot of courses. Here are some tips for attending courses. Though note that residential courses can be as expensive as working with an editor, so weigh up the best use of your money. Reading your work aloud really helps to pick up on clunky phrases and repetitions that you miss on the page. I started doing this when I was preparing my novels for audiobook versions, but now do this on everything I write. If it reads well, it flows well. There are also lots of software options. I purchased a professional SAPI voice from Cereproc in a half-price offer, and use it with the free software Balabolka to generate an mp3 file of any document. The quality is excellent and I can listen to the book on my phone anywhere (even walking or exercising) and make notes of phrases to change. Lots of improvements will be spotted this way. A final tip – I purchased a Scottish voice. This makes me hear the novel in a new way and it becomes unexpected and fresh, so that I hear the words spoken, not the words I expect. None of those stages are one-offs. Some of them you will do multiple times across the whole work, or for specific problem scenes as you rewrite them. The biggest problem with first books is that they are often not quite ready; there’s good stuff in there but there hasn’t been enough rewriting and editing in the rush to get them out the door. Established writers are better at spotting weak points but beginners don’t have that experience yet: so make use of everything you can and invest in your book. We want our work to shine because our reputation, fanbase (and how quickly it grows), and future book sales all depend on it. Ratings and reviews hang around for a long time, and we owe it to ourselves and our readers to make a great first impression.